Amazingly, Strange & Stranger is the first critical retrospective of the life and work of legendary American comic book artist Steve Ditko. The shy son of Eastern European immigrants who was born in Pennsylvania in 1927 may have languished in relative obscurity for the majority of his career, and his political beliefs may have alienated him from his fans and caused him to become a recluse later in life, but Ditko remains widely recognised as one of the comic world’s most admired visual stylists. His work on the Marvel superheroes Spider-Man and Dr Strange, both of which characters he co-created with Stan Lee, put Ditko into the same bracket as Jack ‘King of Comics’ Kirby. Whatever the reasons for having to wait this long for an appraisal, this handsome coffee-table hardback written by Ditko scholar Blake Bell is a very welcome publication. The answers to those questions are not happy ones. Ditko lost royalties and ownership of his work to Marvel Comics, whose shoddy treatment of him prompted him to seek work elsewhere. Fan though he clearly is, Bell doesn’t shy away from this aspect of his subject’s life – indeed, he examines at length the dogmatic political views (based on Ayn Rand’s anti-altruistic Objectivist philosophies) that put paid to Ditko’s popularity and success in his profession. Marvel may not have acted honourably, but similarly Ditko certainly didn’t always act in his own best interests. Which is perhaps why the last chapters read like a lament to talent squandered. This might make for gloomy reading (especially for those comic art fans who know exactly what Ditko denied us and himself), but we should nevertheless be grateful for the years Ditko did produce truly visionary work. 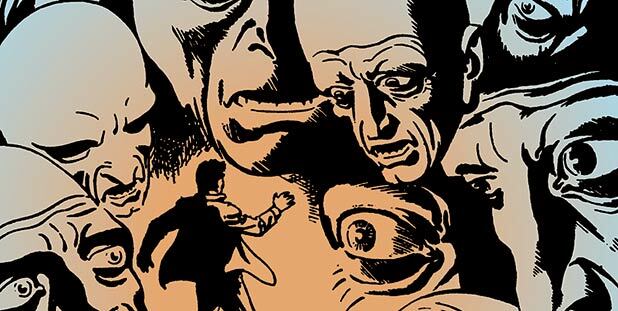 Those years are, primarily, 1962-66, when Ditko pen-and-inked both Spider-Man and Dr Strange, to a lesser degree 1955-62, when he drew horror comics for Marvel, and 1967-68, when he left Marvel to create his Randian hero The Question. Bell provides good, insightful commentary of these fruitful periods. He notes, for example, how Ditko’s approach to Spider-Man was almost plebeian in its down-to-earth realism, while his treatment of the sorcerer Dr Strange was marked by innovative hallucinatory mindscapes. And he also includes lovely microscopic observations such as the hair-bun of Peter Parker’s Aunt May being based on that of Ditko’s own relation. To Bell’s credit (and Ditko’s too), Strange & Stranger succeeds in making you want to (re)read all of these marvellous strips.